Medium: etching (etched by Théophile Narcisse Chauvel after the Corot painting). Published in Paris by L'Art ca. 1880 and printed by Francois Lienard on japon paper, and tipped (lightly mounted along the top by the publisher onto a sheet of heavy Bristol paper). The image measures 7 3/8 x 10 1/2 inches (188 x 265mm). Signed in the plate (not by hand). This magnificent impression before letters was pulled from the plate before lettering was added for the final published state. A lucky find in excellent condition! Jean-Baptiste Corot etching "Soleil Couchant"
Medium: etching (etched by Theophile Narcisse Chauvel after the Corot painting). Published in Paris by L'Art ca. 1880 and printed by Francois Lienard on watermarked laid paper. The image measures 7 3/8 x 10 1/2 inches (188 x 265mm). Signed in the plate (not by hand). Condition: there is some age-toning and discoloration to the margins. 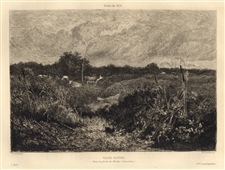 Theophile Narcisse Chauvel original etching "A Country Lane"
Medium: original etching. This impression on laid paper was published in London in 1868 for P. G. Hamerton's "Etching and Etchers". Plate size: 7 1/2 x 5 1/4 inches; 190 x 132mm. Signed in the plate (not by hand). Medium: etching (etched by Theophile Narcisse Chauvel after the Hippolyte Boulanger painting). Published in Paris by L'Art ca. 1875 and printed by Francois Lienard on laid paper. The image measures 6 1/4 x 9 inches. Not signed. Condition: there is some age-toning and discoloration. 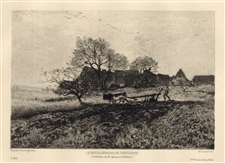 Medium: etching (etched by Theophile Narcisse Chauvel after the Jacomin painting). Published in Paris by L'Art in 1875 and printed by Francois Lienard on laid paper. The image measures 6 3/4 x 9 7/8 inches. Not signed.